As a kid, there were two things that made me go “UGH.” Leftovers and hand-me-downs. If I didn’t like tuna noodle casserole the first time around, I certainly didn’t look forward to having it warmed up for round two. Almost as unsavory, was getting a pair of slacks, a winter coat, or shoes second-hand from a sibling, friend, or cousin. The casserole and the clothes had both seen better days so they were accepted begrudgingly, and were not appreciated as they should have been. Kids want new dinners and new clothes. Anything already eaten or worn was seen as second-rate by my grade-school self. Knowing that I’m a big ACME fan, Mike Dudek recently reached out to let me know that he was paring down his collection and that a couple of ACME rollerballs were up for grabs. I mulled over which one to purchase, then did what any sane person awash in pens would do— I bought both. 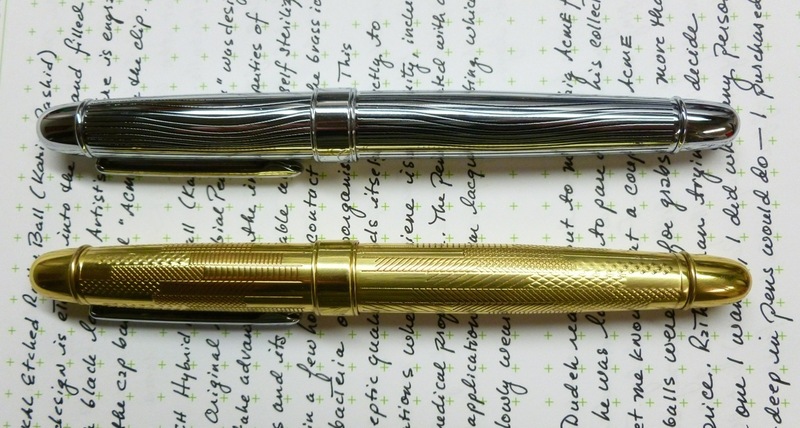 Mike’s prices were more than fair and both pens are in pristine condition. Unlike the ungrateful child I once was, grown-up Mary is a very happy second owner. 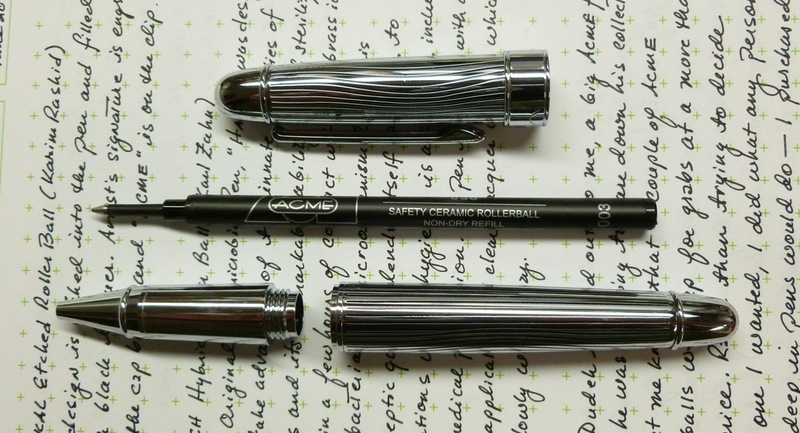 The ACME OPTIKAL rollerball arrived with the standard ACME 888 Safety Ceramic Rollerball refill (Fine point) installed. It lays down an even, very dark line and runs about 0.6 to 0.7 mm— soooo smooth on my Levenger Vivacious free leaf notepad paper. 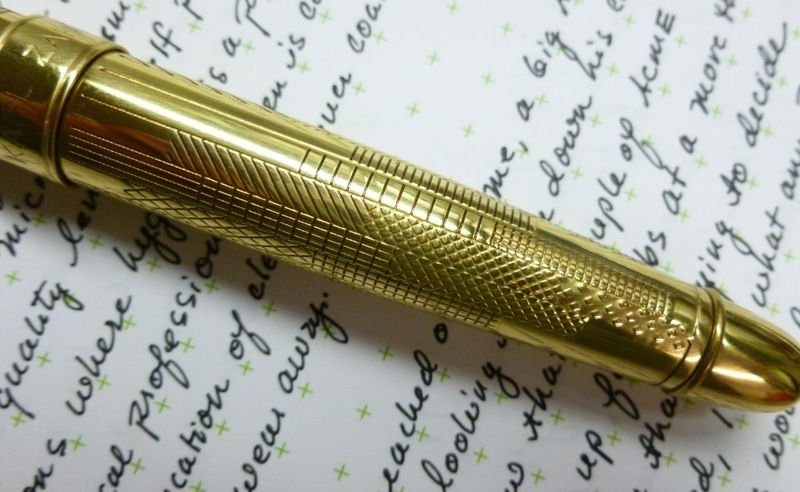 This brass pen features an undulating etched design that’s filled with black lacquer for a unique look. The designer behind this pattern is Karim Rashid, and his signature is etched into the cap band. 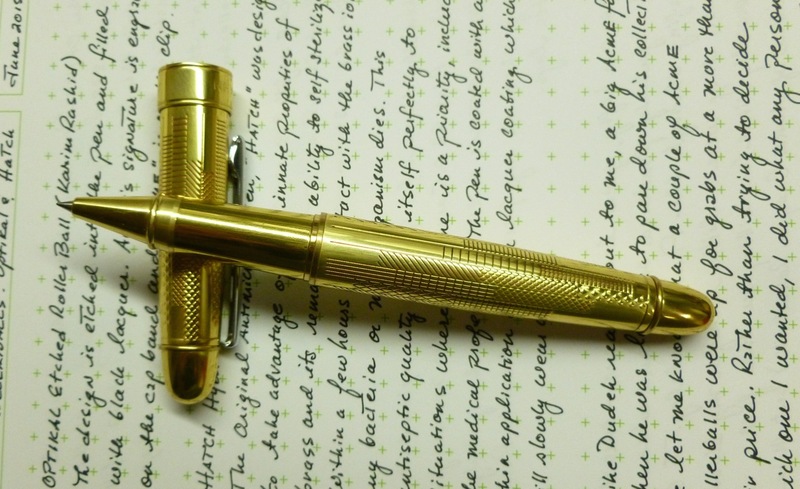 It should be noted that the HATCH rollerball is actually coated with a thin layer of lacquer (for shininess), which will eventually wear away to expose the raw brass and its wonder powers. I just think it’s a cool pen. I’ll still rely on hand washing to avoid germs. 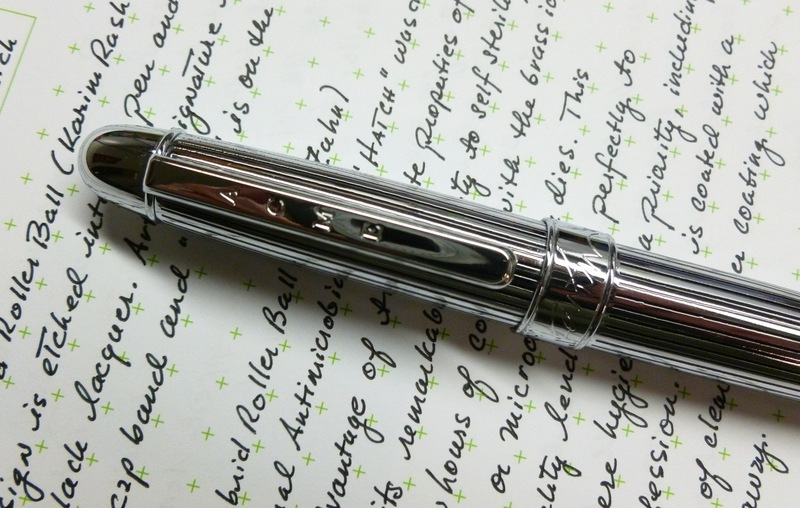 This pen arrived from Mike with a Pilot G2 0.38 mm refill installed, and I was like, WHAT??!! 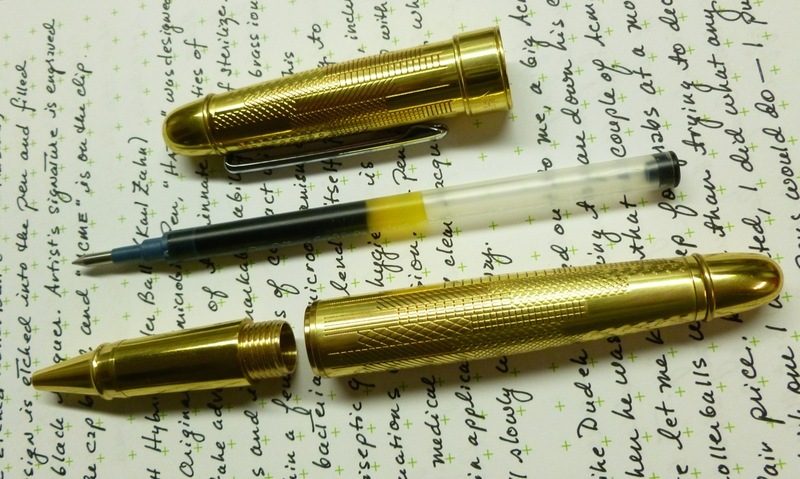 Until then, I hadn’t realized that the Pilot G2 refills fit the capped ACME pens. Lightbulb moment! 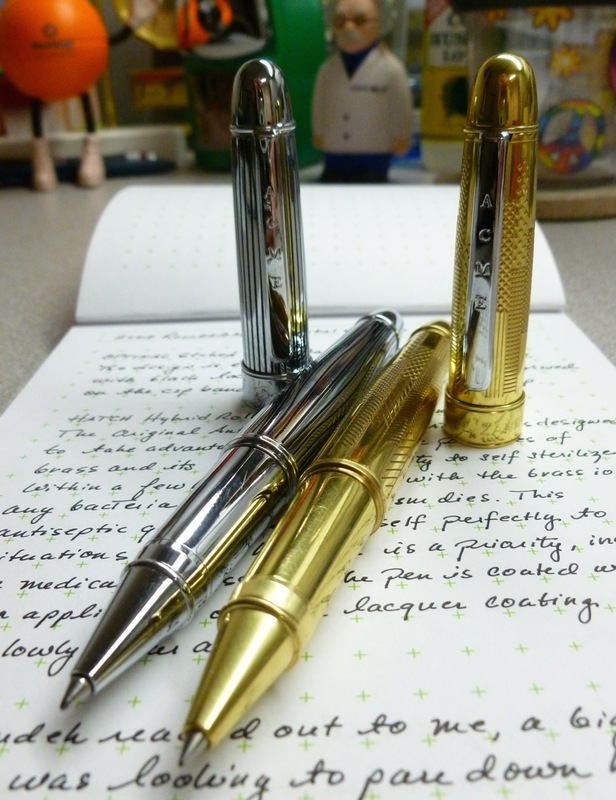 These are hefty (about 42 g), great-looking pens that I’ve lovingly ogled as I leaf through every single edition of the Fahrney’s catalog. Brand new, they’re a quite a bit more than I was willing to pay, but Mike made me an offer that I couldn’t refuse. That, I guess, is my takeaway message— keep an eye out for deals on second-hand pens. You just might pick up a gem from someone looking to down-size their collection. To be sure, ask questions and buy from folks you know and trust. 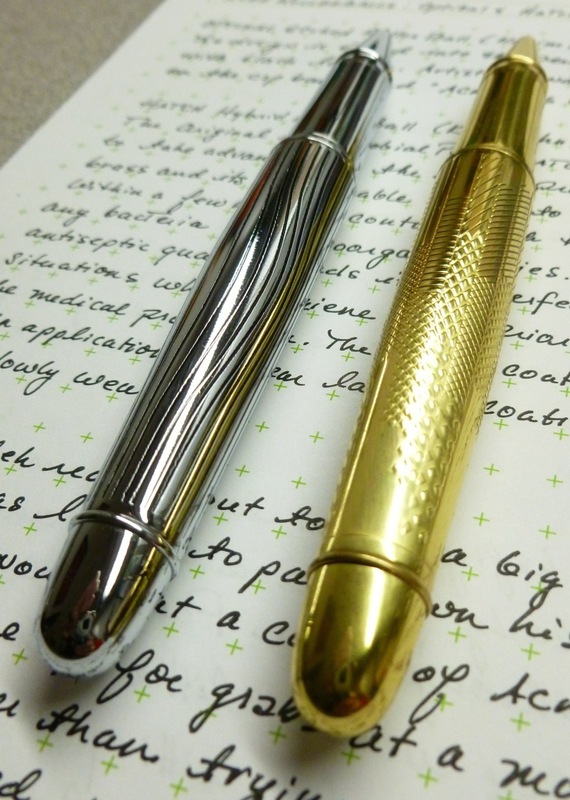 If you do your homework and proceed with care, you can score some first-rate pens at reasonable prices. 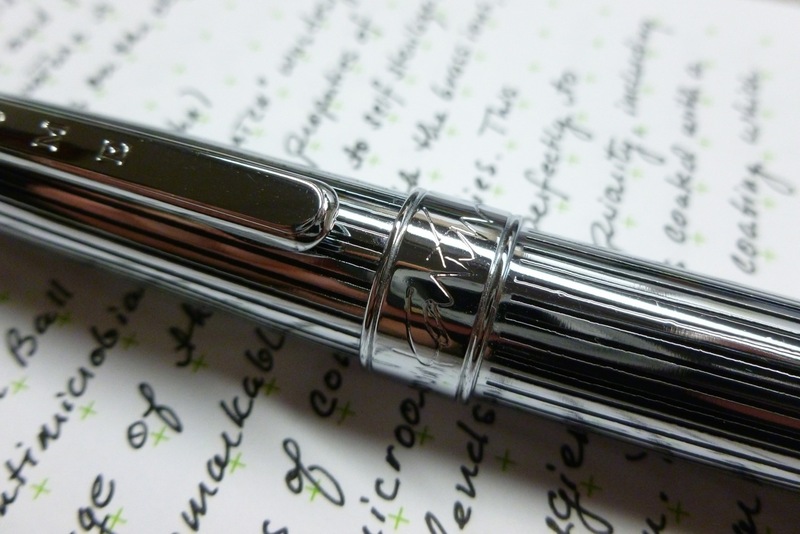 Keep your eyes open and you might just be able to purchase a pen you’ve worshiped from afar. That’s not a hand-me-down—it’s absolutely a hand-me-up. Mike’s gorgeously photographed full reviews of the ACME HATCH and OPTIKAL rollerballs can be found HERE and HERE, respectively. Quick medical update: I saw the out-of-town MS Specialist on Tuesday and was very happy with him and his practice. He’s not, at this point, convinced that the MS diagnosis I received is correct, and has mapped out a prudent plan for getting to the bottom of my symptoms. There are lesions present, but they don’t necessarily mean I have MS. He’s scheduling more testing in the coming weeks—another MRI and a spinal-tap— to try to confirm or deny the original diagnosis. I came away impressed and cautiously hopeful. I remain incredibly appreciative of the good thoughts, letters (a bundle of which arrived today), and heartfelt sentiments that you’re sending my way. This is a physical and emotional roller coaster ride, but you’ve been amazing in lifting me up. I will, of course, keep you posted.